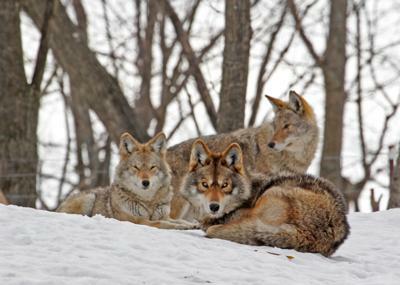 I am about 98% sure that I saw a pack of three Coyotes about 10:00am on Sunday morning while I was running on Hamilton Rd, near Commissioners Road, just south of the Thames River, in London, Ontario. They were about 150 yards away from me, heading north towards the river. They were all the same color and looked alike, very similar to the picture on one of your pages. I am sure that they were not Deer. Thank you, Hilton, for your contribution to our website - fancy that! Coyotes so close to the centre of London. We have heard them howling close to London Airport, and once spotted one on the south side of Dundas Street, just east of the Airport. There seems to be quite a lot of coyotes in this area. Just a couple of weeks ago, I saw one dead on Veterans Parkway, between Bradley Avenue and Hamilton Road, London. I have seen several coyotes in and around London over the years. More recently (in the last two years) there have even been two that have been hit on Highbury Ave, just between Hamilton Road and Commissioners Road, by the Thames River, London.